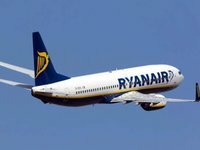 The Irish low cost air carrier Ryanair will launch flights from Kyiv to Berlin from September 2018, the air carrier has reported. The airline intends to begin flights from September 3 with a frequency of four times a week on Mondays, Wednesdays, Fridays, and Sundays. The minimum price of a one way ticket starts from EUR26.99. They are already available on the air carrier's website. At the same time, the air carrier said the promotional price will remain relevant for booking until Sunday, April 8. "This will be the first Ryanair route to/from Ukraine. Flights will begin two months earlier than originally planned," Head of the Ryanair Communications Department Robin Kiely said. Berlin became the 11th direction from Kyiv, to which Ryanair opened ticket sales.